Darling Retreat est parfait pour une escapade de vacances calme et relaxante. Un chalet / appartement de détente idéalement situé à proximité de la rue principale de Sorrente. Situé dans la pittoresque Darling Road, le Darling Retreat est le refuge idéal pour les célibataires ou les couples, qui souhaitent explorer tout ce que Sorrente et la péninsule a à offrir… ou pas! Il suffit de rester à la maison et profiter de ce charmant appartement cottage. Very sweet studio for our overnight stay in Sorrento. Very neat and tidy place. We loved staying in this beautiful unit. It had everything we needed for a great weekend away. It was very comfortable and private. We walked everywhere in Sorrento, even to the back beach. Can't wait to stay again. Great space to spend a month over summer. 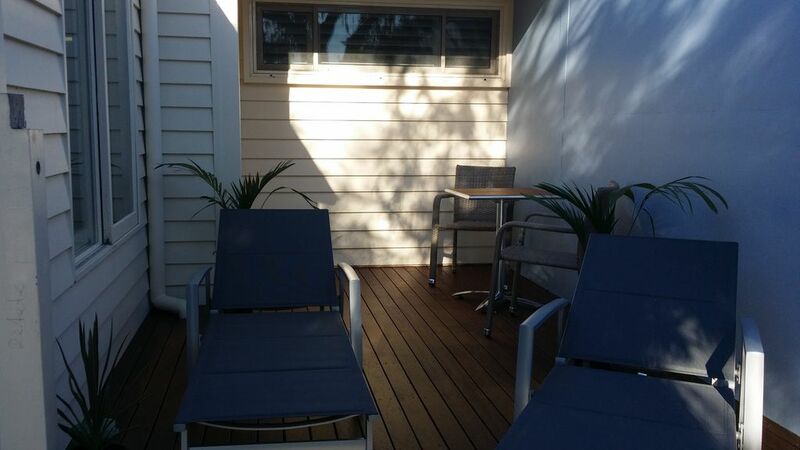 Just a few minutes walk to the fabulous Sorrento shops, and a few minutes more to either the bay or ocean beaches. Fantastic amount of storage, sunny little courtyard with washing machine in a cute 'beach box' and off street secure parking. Daryl and Angela were great hosts. It was a pleasure to have Jackie and Paul stay in our home apartment. All communication was easy and clear and they were respectful of our home. So pleased they enjoyed their stay at Darling Retreat. Excellent guests who we highly recommend to other hosts.